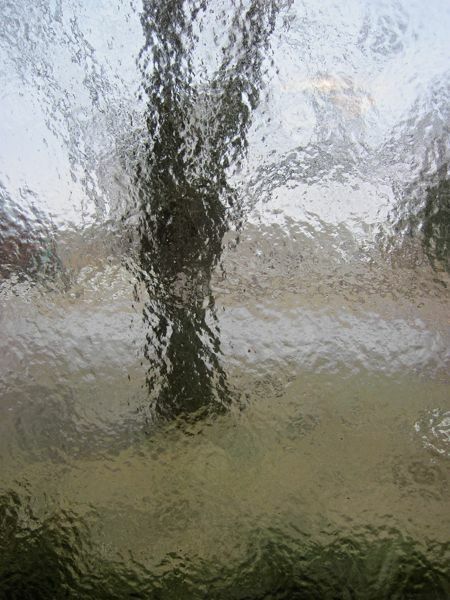 January 27, 2013 – Want a Little Icing on that Earth? Even though I’ve got photo editing software that puts this effect on any photo, the following are real, undoctored photos. 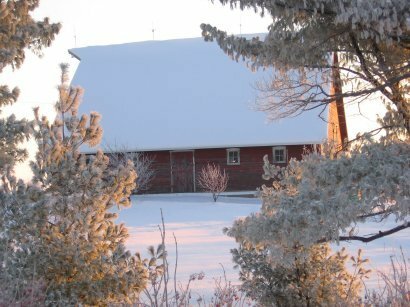 The view out the kitchen window looking towards the doghouse and barn. A maple tree in the front yard. 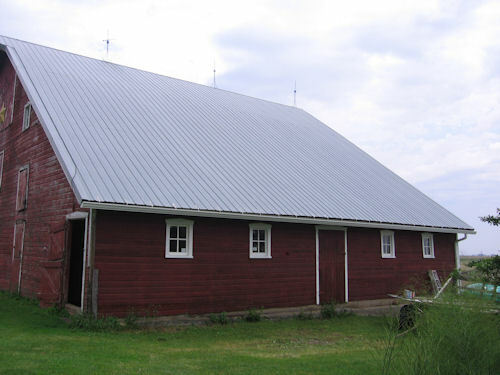 The detached garage. 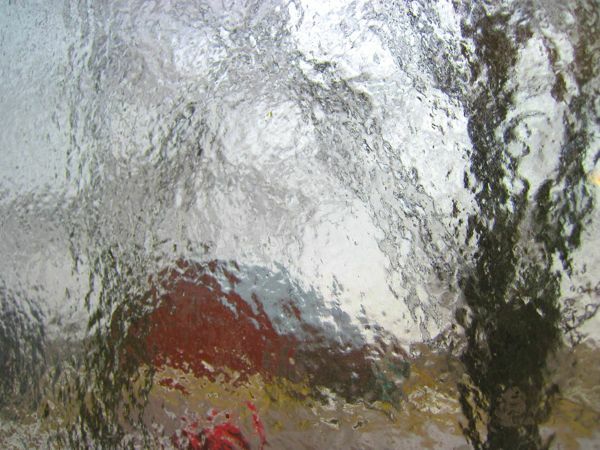 Everything is shut down this morning because of the ice. I was hoping for a power blip or two as I finally broke down and bought a UPS (uninterruptible power supply) this week so the computer would work through power blinks and shut down properly during an extended outage with battery back-up. 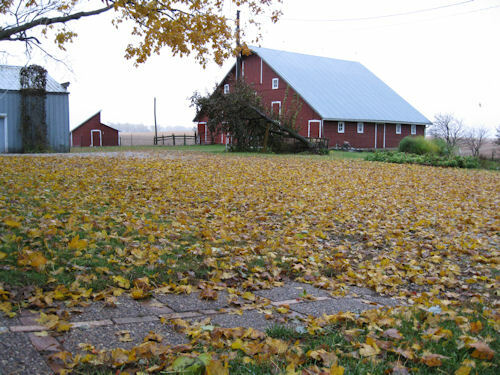 The barn in fall. No other comment needed. We awoke to a few inches of very heavy snow with a thick layer of slush underneath. 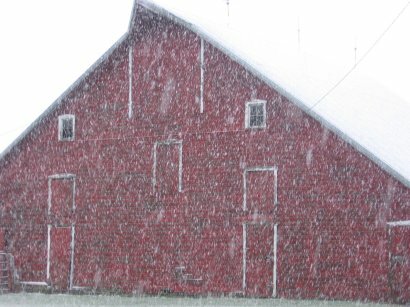 It’s the kind of snow that tends to swoosh off the barn in one giant slide. It’s also the kind that isn’t fun to drive in. 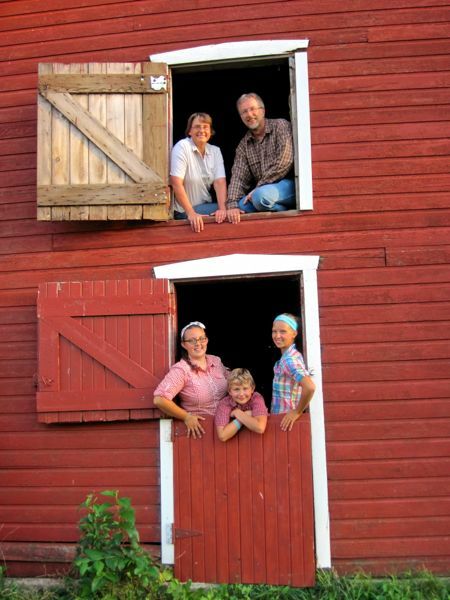 Emma needed to be to school early, so she was off before the roads were plowed. The road had three ruts, with each lane sharing the common center rut – a semi-truck approached and as she moved over into the deep slush and the semi blinded her with a windshield full of slush, she lost control and avoided a car traveling behind the semi and ended up resting in the ditch – thankful that she didn’t collide with the oncoming car or roll as she traveled down the steep ditch. She wasn’t the only one as there were 4 vehicles in the ditch on the way to town, including a jeep that had rolled. 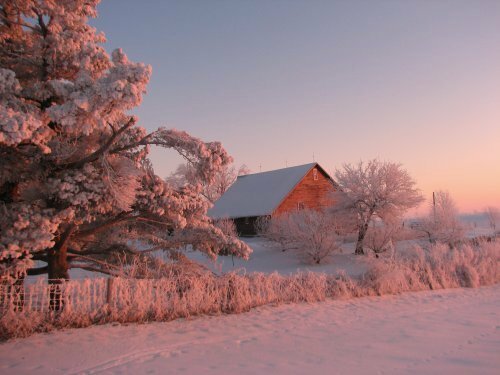 A beautiful frosty morning greeted us today! 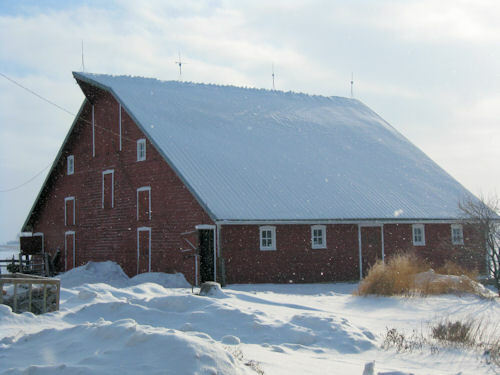 I’m pleased there’s just enough snow to cover the ground for a white Christmas and insulate the ground, but not so much that I’ve had to spend hours moving it. 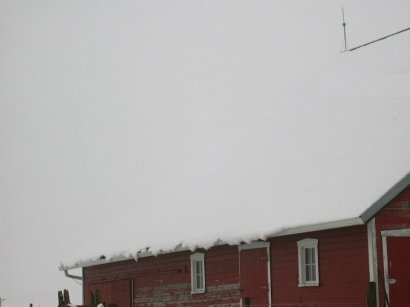 I absolutely adore the weathervane/lightning rods on the barn. I especially like the round blue and white glass balls. 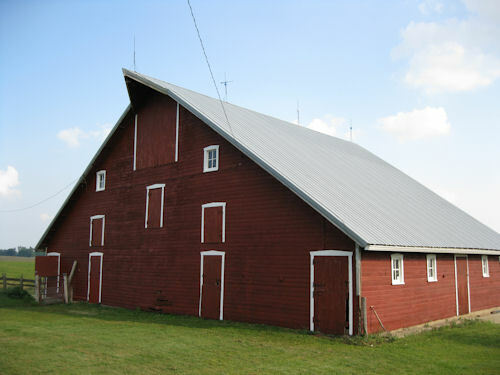 This is a view straight up the barn roof. 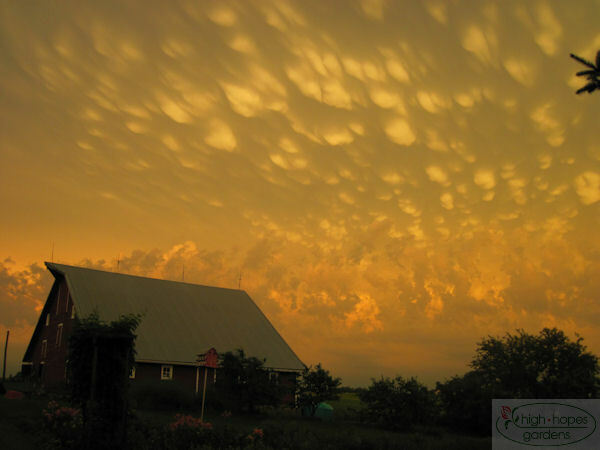 June 20, 2010 – Mammatus! 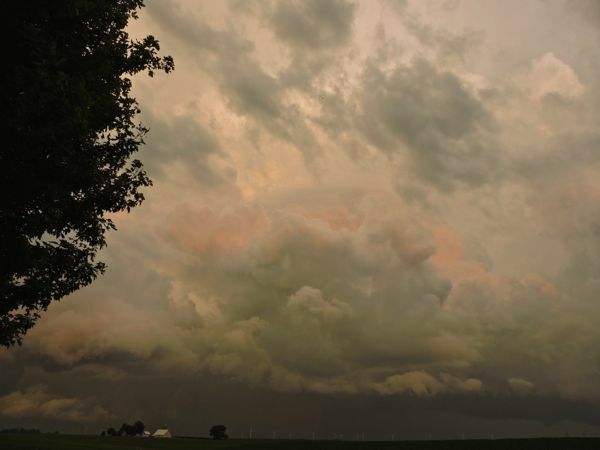 We had a spectacular show Friday night as the second round of storms for the day passed by to the east. A nice field of mammatus clouds developed. 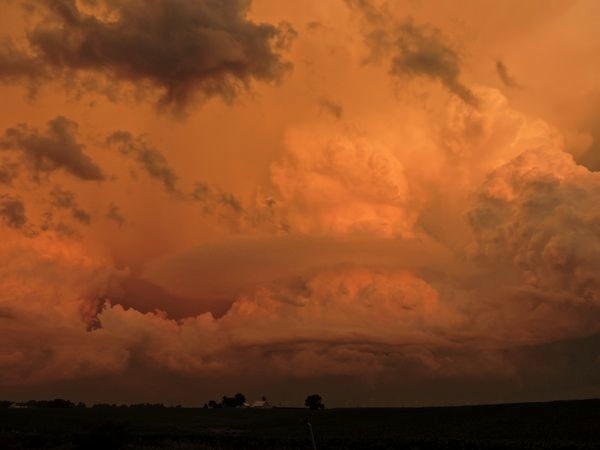 I went out anticipating that the thunderheads to the east might have some interesting illumination from the setting sun to the west, but was very pleased to see these clouds and watch as the grew and developed. 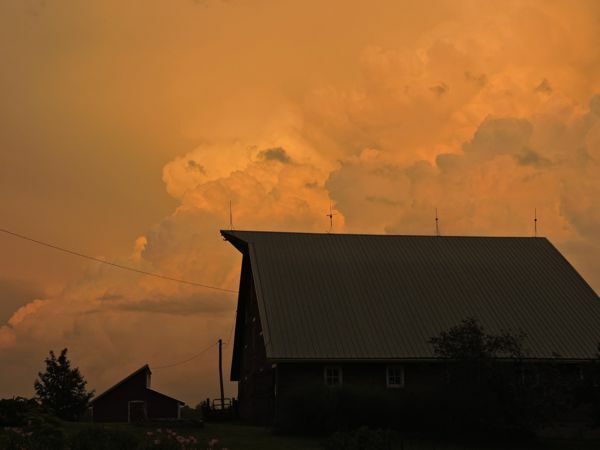 The following bit of information is condensed from Wikipedia: Mammatus are most often associated with the anvil cloud that extends from a cumulonimbus (thunderheads). 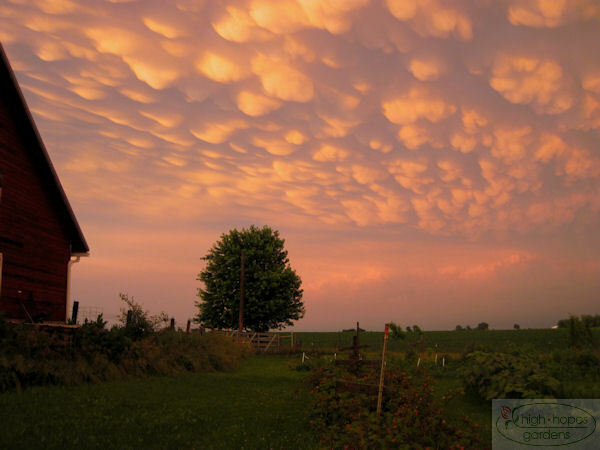 Mammatus are often indicative of a particularly strong storm or maybe even a tornadic storm. 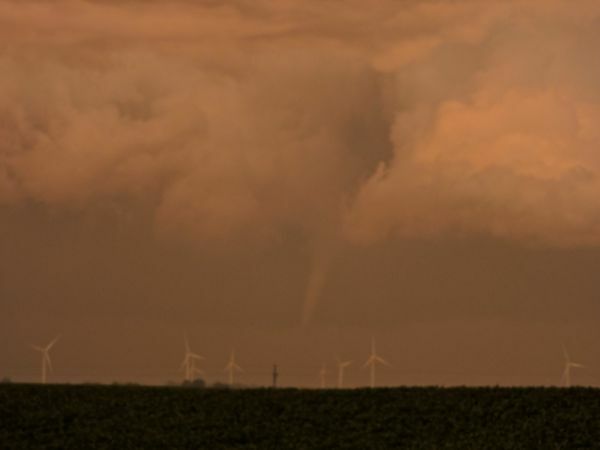 These tend to form more often during warm months and are most common over the midwest and eastern portions of the United States. 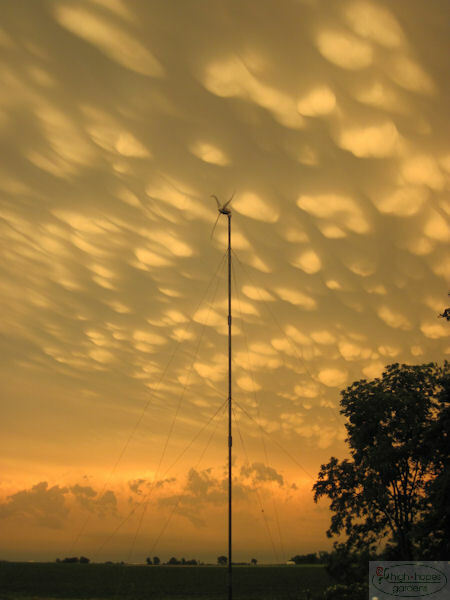 Mammatus may appear as smooth, ragged or lumpy lobes and may be opaque or semitransparent. 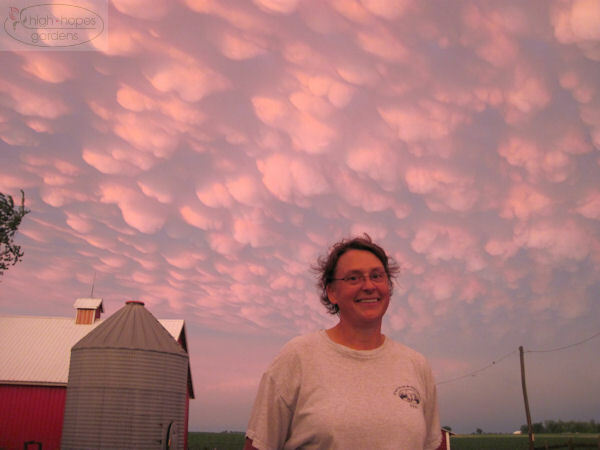 Because mammatus occur as a grouping of lobes, the way they clump together can vary from an isolated cluster to a field of mamma that spread over hundreds of kilometers to being organized along a line, and may be composed of unequal or similarly-sized lobes. The individual mammatus lobe average diameters of 1–3 km and lengths on average of 0.5 km. A lobe can last an average of 10 minutes, but a whole cluster of mamma can range from 15 minutes to a few hours. 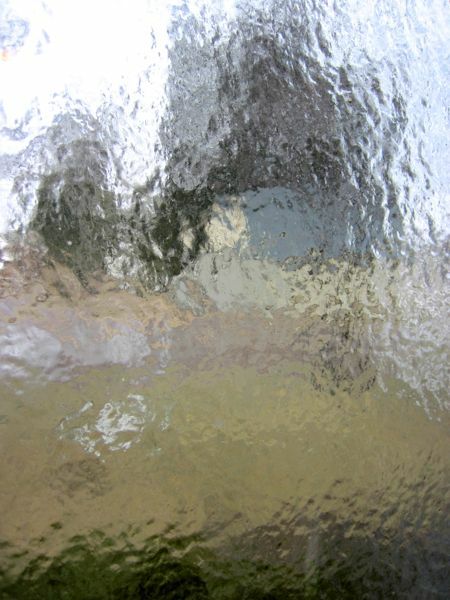 They usually are composed of ice, but also can be a mixture of ice and liquid water. 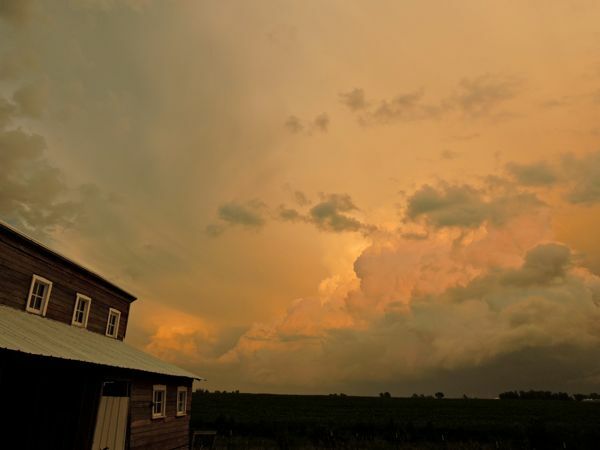 As the sun sank lower, the clouds turned from yellow to red. It was rather exhilarating to be outside walking under this strange meteorologic phenomenon under a wide open sky! 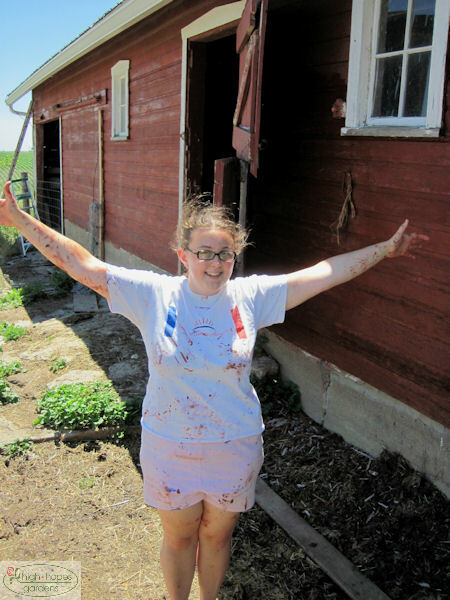 Looks like Claire managed to complete staining the east side of the barn. There is not complete agreement as the window frames are left unpainted, but daughter claims that was not part of the instruction since no white paint was left in an obvious location. At any rate, the stain-splattered body tell me that she indeed make a good-faith effort before her looming trip to India! We had about 2-3 inches of what I call “stagecraft snow” Saturday night. 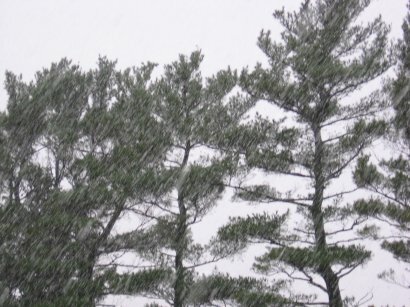 The gentle, large fluffy flakes that lazily fall down on a calm evening. They gently rest wherever they fall and adorn everyday objects with a new look. 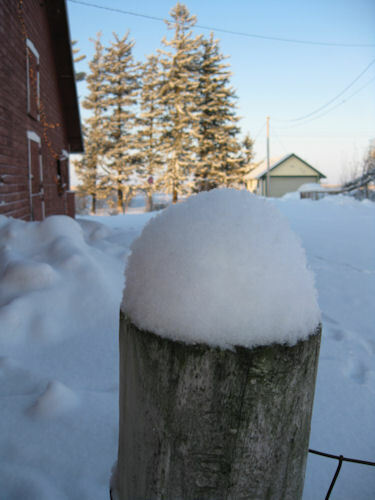 Whether it be a hat on top of a fencepost. 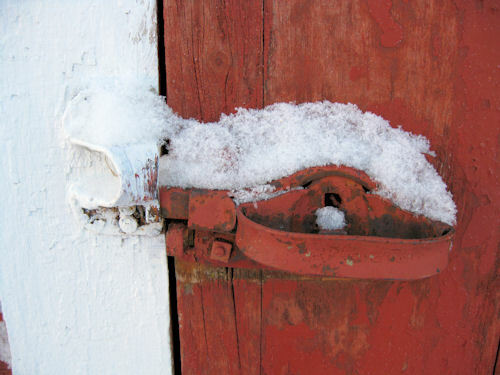 Or a symmetrical snow carbon copy on the barn handle. 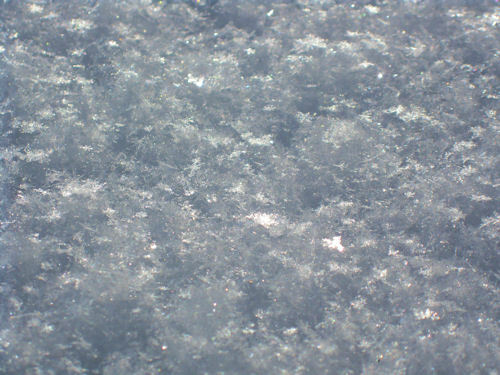 And even a few moments of the fluffy flakes glinting down in the sunlight. 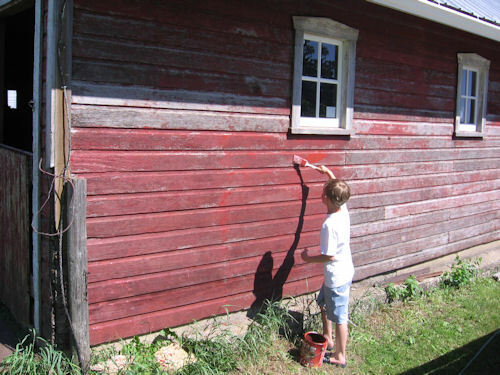 The flurry of barn painting this summer is as complete as it is going to be until spring – 3 of the 4 sides stained. Two weekends ago we had 70 degrees and a north wind, so it allowed me to get up high and finish the south side. The doors and trim on the back need replacement as well, but that’s probably a next year item as well. The weather the last week has been particularly yucky. Constant rain, cold, and wind. Virtually all these leaves fell off Last Thursday night – a particularly cold and windy night. 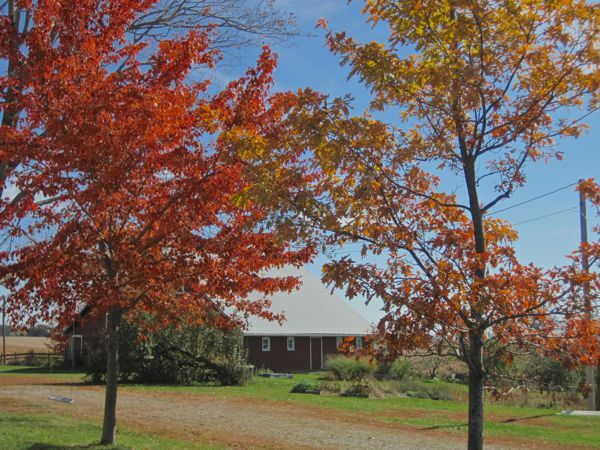 It seems like we’ll miss out on a bit of fall color due to the fast leave drop. 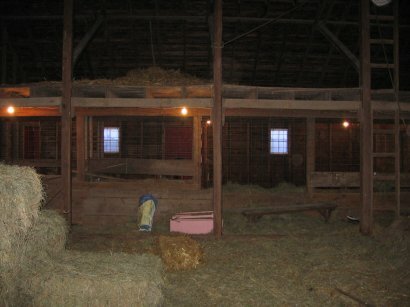 I neglected to take a picture of the south side of the barn before I started, so here is one after I couldn’t help myselfÂ and got started. The weather has been fantastic for painting – upper 70’s and little if any wind for the last 10 days or so and not much change in the forecast going forward. This side will take more time – almost every door needs to be rebuilt and new trim cut and painted. 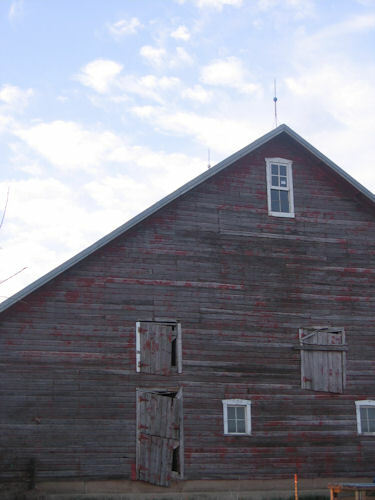 I’m also not sure how I’m going to handle painting the top six feet or so – it’s out of ladder range for me – so I’m tossing around renting a cherry picker or hiring it done. 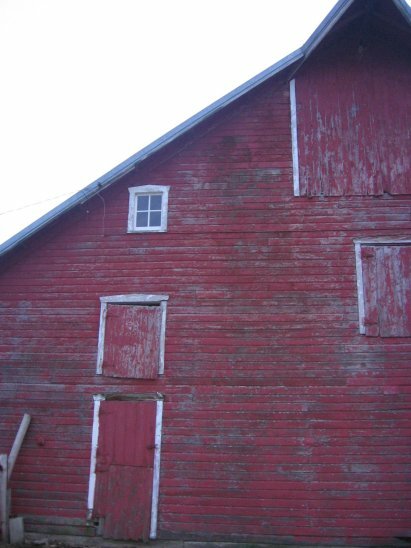 September 8, 2009 – North Side of Barn Painted! 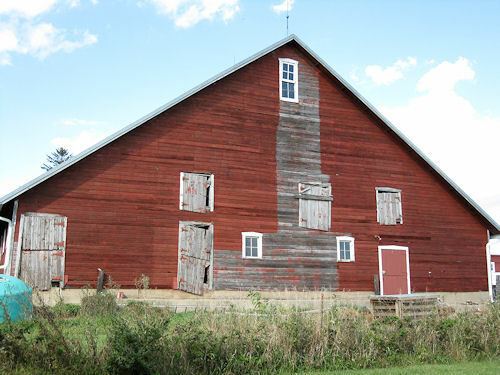 When I started staining the north side of the barn a few weeks ago, I never imagined it would get done so quickly. The combination of dry days in the 70’s and helpers at home to watch when I was on the high areas helped this get done very quickly. It’s very seldom something gets done ahead of schedule, but this project beat winter by a long shot. 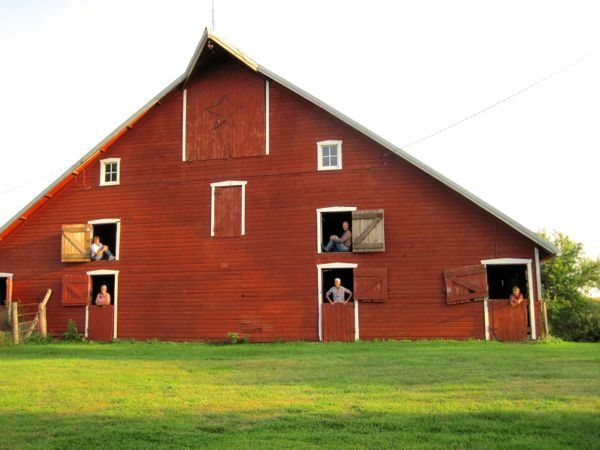 We completed the west and north sides of the barn this summer (as long as we don’t look at the east and south sides, we can be happy). 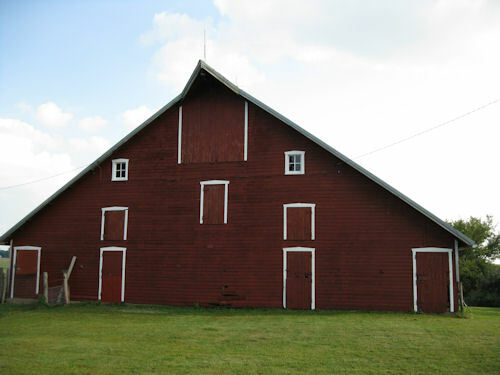 Here’s a head-on view of the north side, recently stained and painted barn. There are still some odd boards to replace, but the barn is more ready for wetness now! The white trim against the red sure makes it look sharp. 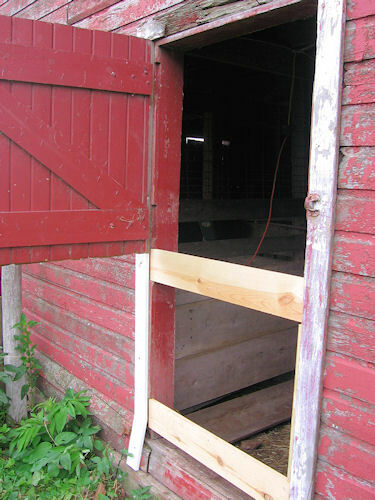 Today I’m going to pass on a neat trick to rebuild barn doors. 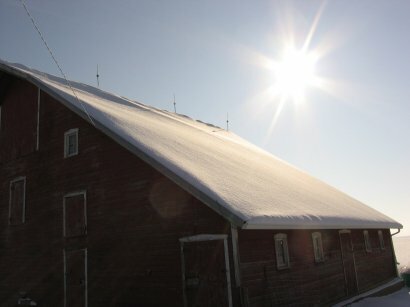 Our barn has entry doors with separate top and bottom doors. The interior cross-member bracing fits into slots built into the door frame. The first time I tried to build a replacement door, I measured and built the complete door perfectly square in the shop and when I went to attach it, found out neither the frame, nor the adjoining door was square, so I ended up cutting and shaping the new “square” door to fit and it took way too long. 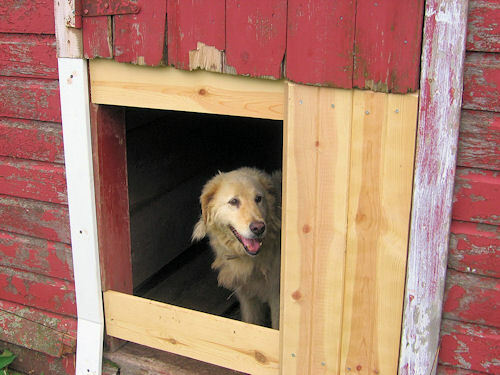 A neighbor saw my struggles and offered a bit of advice – forget working in the shop and build the door in place. The first step is to nail the interior cross bracing into the slots on the frame. Just nail the boards in with small finishing nails, because after the door is built, these nails will be pounded out as the door swings open for the first time and either pulled out backwards or pounded into the board. The top picture shows the two interior boards temporarily nailed in place. Next, measure and attach the exterior boards. In this case, they were all slightly different lengths. You’ll notice that in this picture the white door trim is split near the threshold. This bothered me, so shortly after this photo was taken, I got the tractor out and was able to use the loader to push in the bottom threshold beam back into place and replace the white trim board with one straight piece. 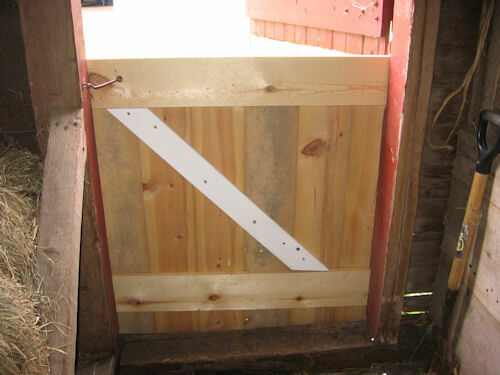 The boards are nailed or screwed in place and the hinges attached while the door is still nailed to the frame. After the hinges are on, just tap out the door and remove or pound in the finishing nails holding the first two pieces in place. Here’s an interior door of the completed door (minus painting). 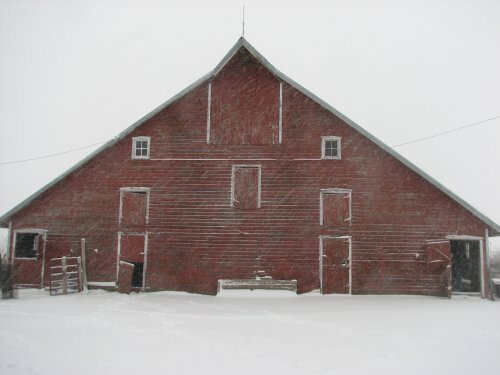 Although it doesn’t look nearly as stunning in this photo as in real life, the west side of the barn has been stained and painted. I love the contrast between the fresh white trim and red. 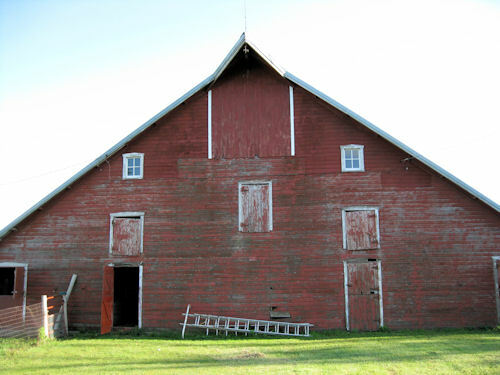 Now instead of having red and white “highlights,” the barn actually looks like is should. Now onto the other sides as time allows. 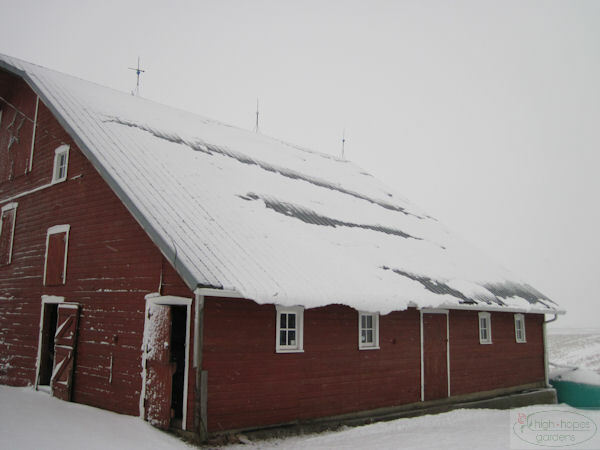 There were three windows that needed to be replaced in the barn and by far the most challenging one was the highest one on the south side of the barn. In this photo the window is replaced as you can still see the sticker on the top window (no, I’m not going back up to take it off). 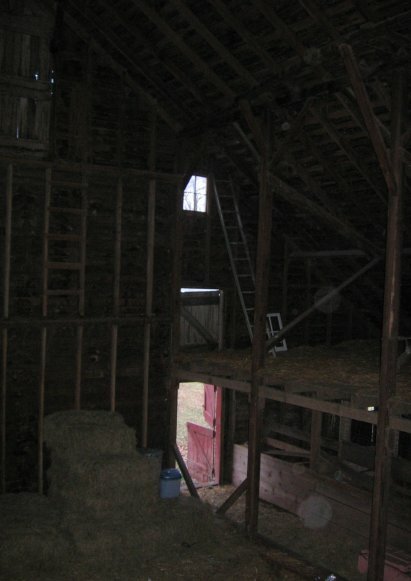 There is a rickety old ladder inside the barn that leads up to the window. I was climbing up it and had Martin as a witness to watch and serve as a witness and run for help in case something went terribly wrong. 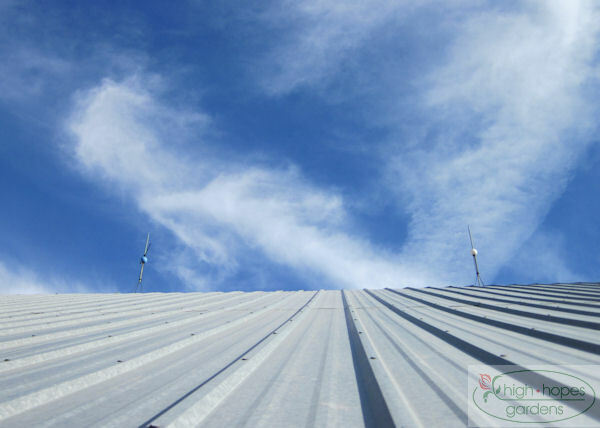 I was nearly to the top of the ladder when simultaneously, as I’m grabbing for for the last rung Martin yells out – “Dad a raccoon!” and I see a raccoon scurrying a couple of feet away from my hand. The raccoon scuttled a short distance away and I pulled up the window with a rope and got it installed. I wish I had the agility of the raccoon at great heights. 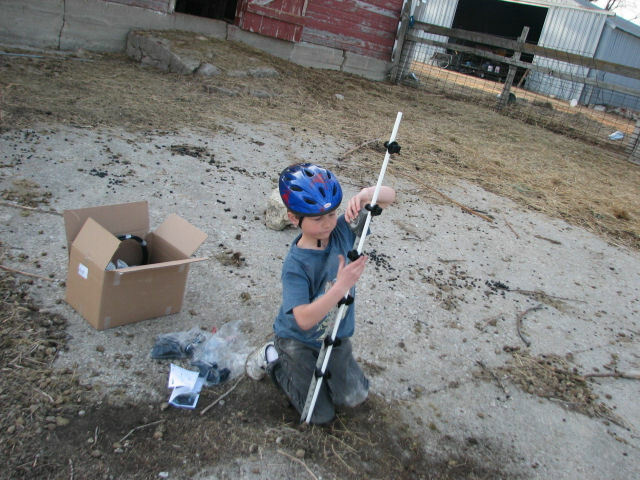 With some mixed species barn, we’ve been having to work harder than we need to to keep the horse away from the lambs. 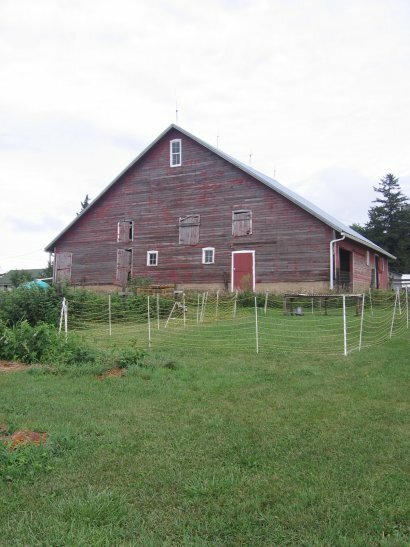 So, I’m going to put up an electric fence across the cement pad adjacent to the barn, so everyone can easily get outside. Once the pastures firm up it will be easier to manage, but in the mud season, it will be nice to have a solid place for everyone to be outside. I’m going to drill holes in the cement, insert some fiberglass poles, and run electric rope. Since the animals are on a cement yard, I’ve been told I’ll need to run an alternating hot/cold rope fence since the cement prevents a good ground connection – so the animals won’t get shocked until they touch two wires. Martin recently celebrated his 7th birthday. Happy Birthday Martin! 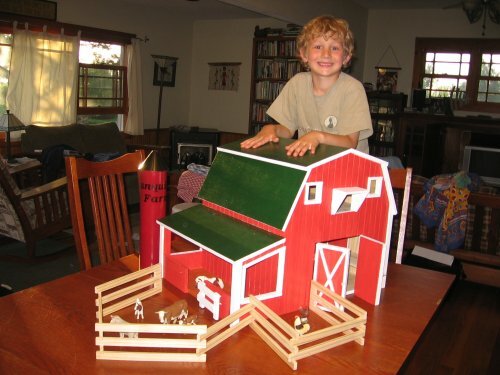 Here he is with a toy barn and silo Nana gave him. Linda a Claire went above and beyond the call of duty and took Martin and 4 other boys to the science center to see the dinosaur exhibit and IMAX dinosaur film! 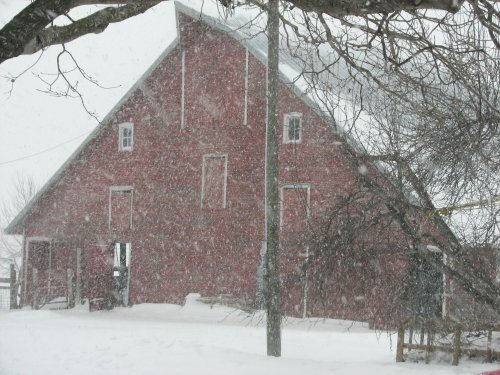 Today was a day of intermittent snow – the big, heavy flake variety. I got to stay home with a sick Martin today. He had some extra TV time and watched animal life shows and played a game of dog-opoly with his Dad. 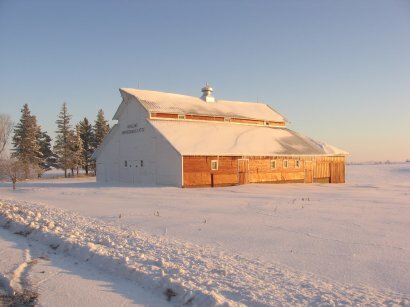 It was a bit of a foggy overnight, so that left a winter wonderland this morning. 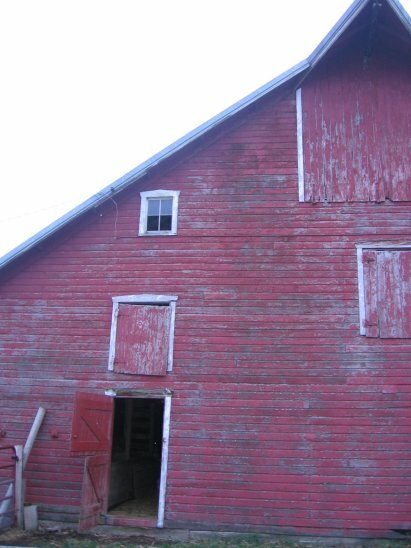 The pastelly red sunrise wished it could be as red as the barn, but it only managed a deep pinkish hue. 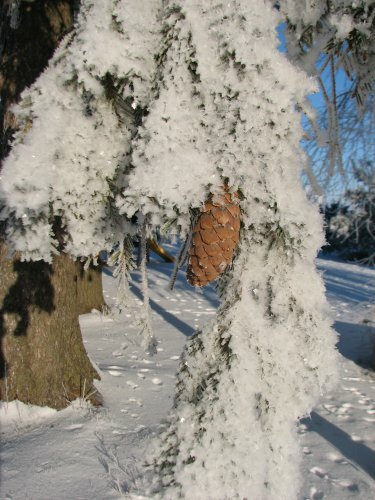 The hoarfrost held on most of the day – the above freezing temperatures did not make it today. 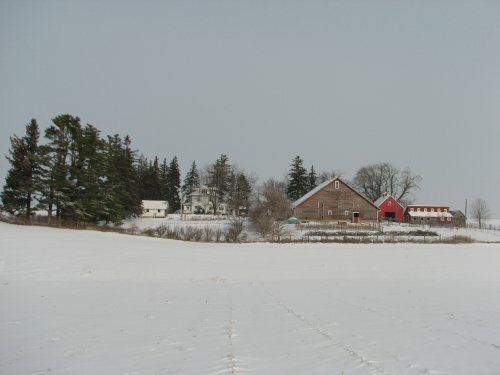 The first snow that required the tractor to come out and move snow fell Thursday. 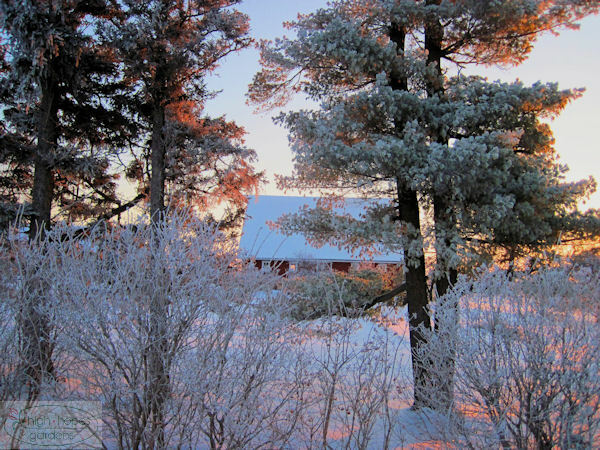 It was a relatively small wind-free snowfall so it sat nicely upon the branches and landscape. The girls have started to attack a barn horse stall. 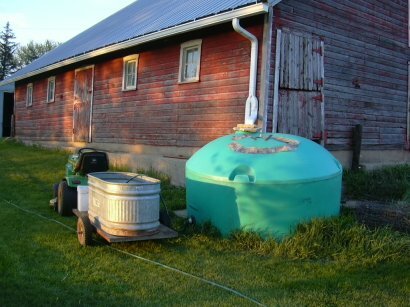 This one has been filled with corn cobs (and has been since we moved in). 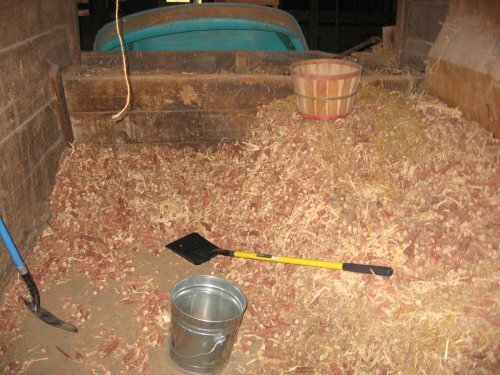 I attached it one afternoon with a wood chipper to make some chicken nest box bedding, but haven’t done much with it lately. 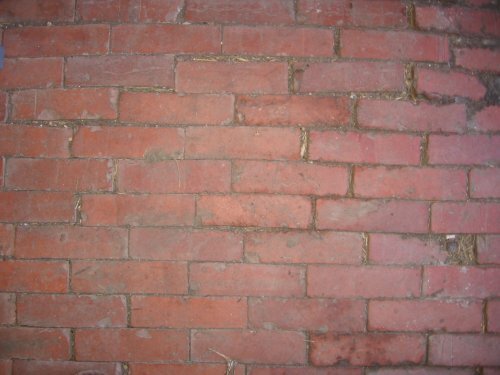 The alley along the stalls is this nice red brick. 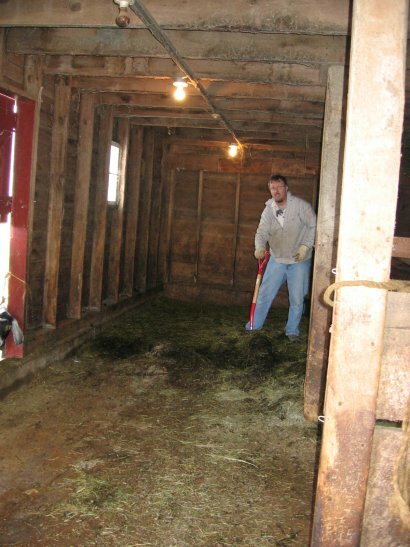 We were surprised when we cleaned the dumping groundsÂ out of the barn a while after we moved in to find this wonderful floor. 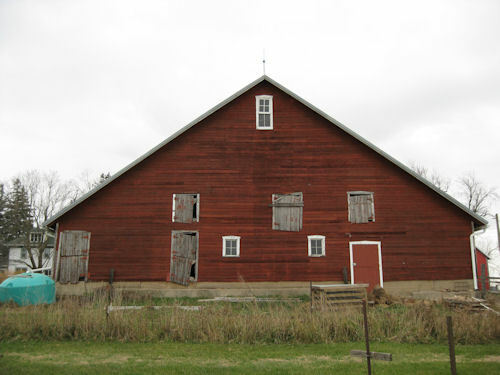 We had someone from the Iowa Barn Foundation come look at the barn and he said if we wanted to the barn would probably be eligible to be listed on the National Register of Historic Places because of this floor and the unusual roofing support. 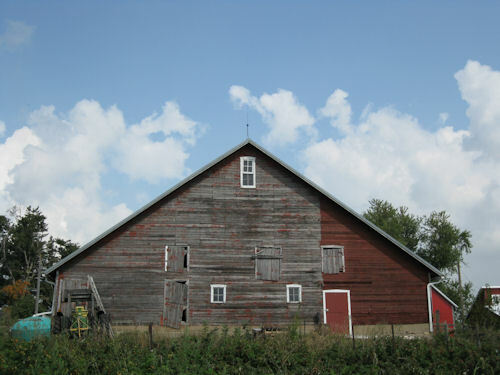 We haven’t pursued it, but are fixing up the barn as we have time – mainly needs new windows and doors. Not many days you can see a barn burn down AND hear Wendell Berry speak! 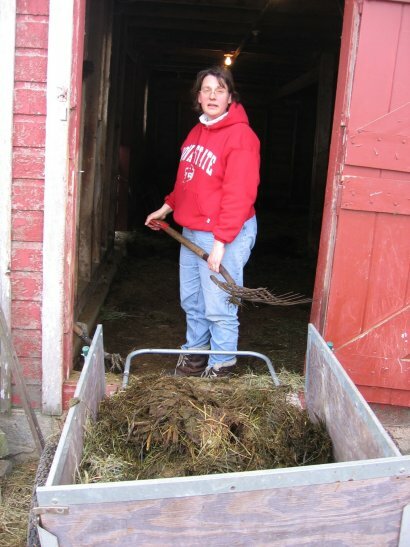 First, to the barn. 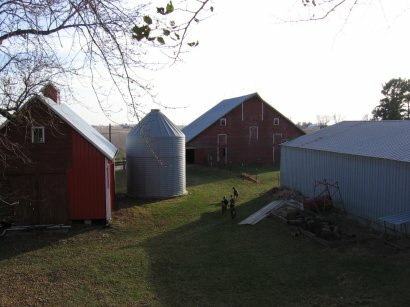 A few months ago, I wrote about a century farm (one that is honored to be owned by the same family for over 100 years) that was let slide into disrepair and intentionally burned). 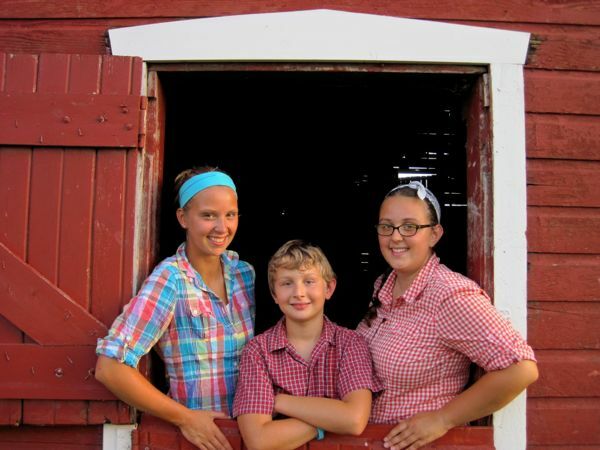 We were headed to church on Sunday morning and the smoke had just started pouring out of the barn. Mesmerized with the size of the fire, we pulled over on the side of the road to watch (I wasn’t willing to drive back home to get the camera, some moments have to stay that way). 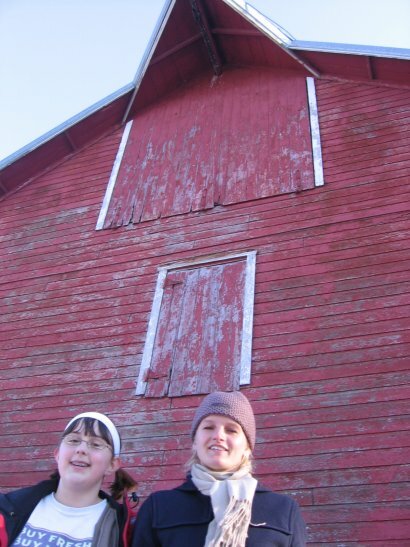 It was about three minutes from the time the barn was in full flame until it collapsed to the ground. Huge vortexes of flame shot out of the door to the hay loft. The barn wasn’t it good shape (see picture from last winter), but it is sad to see another barn go. It is way too common. Our skyline changes once again. 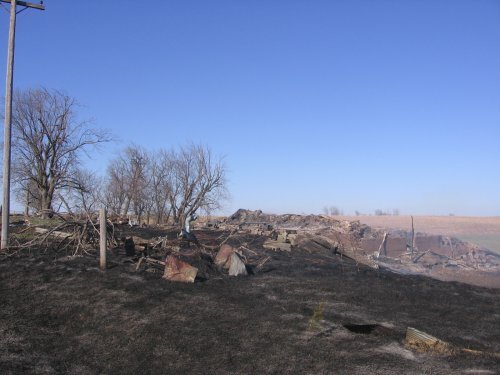 That night, about seven hours later, we were driving back to Ames to see Wendell Berry and something had re-ignited the ditch near the barn and the fire was heading south quickly – the fire trucks arrived as we were driving down the road to survey the fire and whether anything was in its path to stop it. Now we have a complex – our 2 now-famous fires (two different trips) where places we were just at/just arriving burned in Texas – and now, happening across the height of two different fires in the same place, the same day, hours apart. 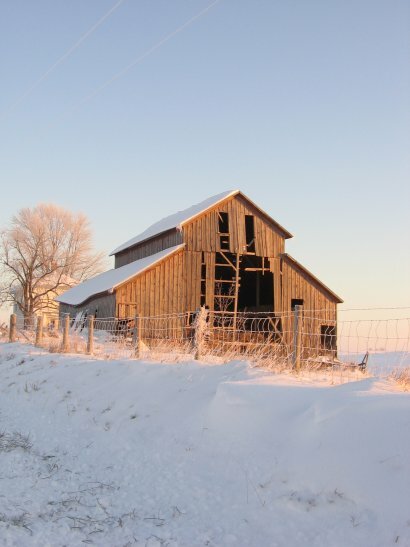 In case you haven’t seen it, Sugar Creek Farm has a post and incredible photos of an old barn burning down. 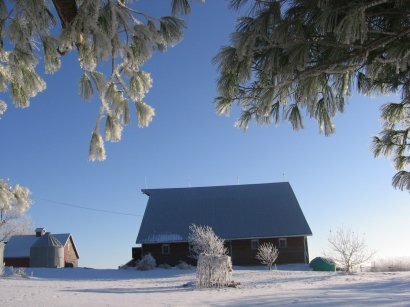 In the evening we went to see Wendell Berry, an author, poet, social critic, and farmer whose work I have long admired. He appeared at Iowa State in the Great Hall. In an attempt to make the evening more intimate, it was set up like a talk show – with other speakers besides Wendell on stage to make conversation. Unfortunately, the sound system sounded and acted like it was purchased second-hand from a McDonald’s drive-thru, so I wasn’t really sure what all he said – there was an overflow crowd as well. When they opened it up to questions from the audience, again, unfortunately, there were questions that didn’t elucidate elaboration, or worse yet, just plain ramblings by people using the microphone to introduce the audience to their web site and pet peeve. All in all, it was an unsatisfying event that held so much promise to be good. I’ll have to read his latest book to make up for it. We haven’t had a foggy morning for a long time. 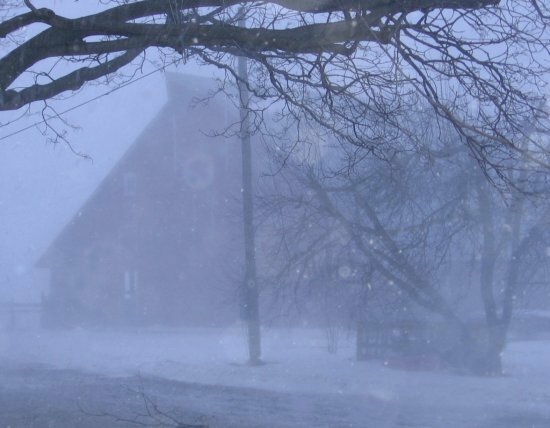 In fact the weather has been pretty awful the last few weeks, between downpours, off and on drizzle, or 35 mph or more winds, it hasn’t been pleasant. 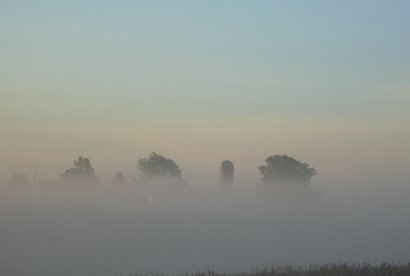 This morning was refreshing to awake to weather calm and foggy. The view of a neighbor’s place at 6 am. 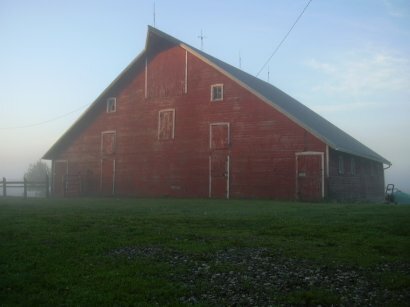 Our timeless barn also benefited slightly from the morning fog and sun. It was a hard day to be in work as it was in the 80’s and pleasant. We’ll see what tomorrow brings.